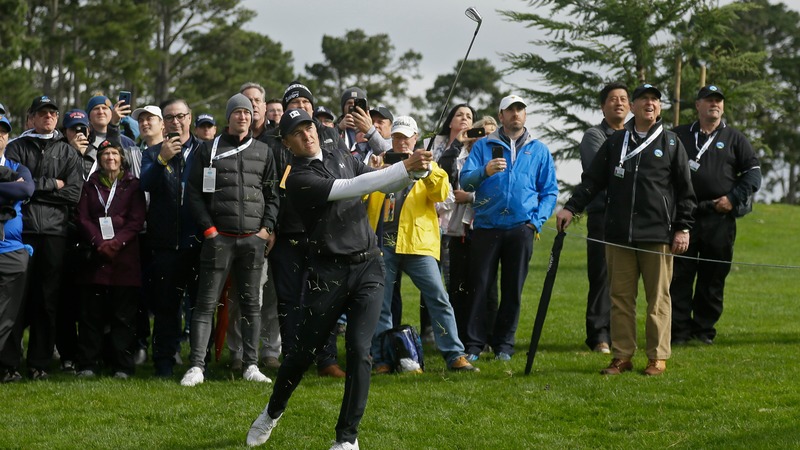 PEBBLE BEACH, Calif. (AP) — Phil Mickelson survived a wild finish without having to deal with the rain. Jordan Spieth endured a wet finish to his day with three tough pars, followed by some unwitting help by a spooked fan. Both were atop the leaderboard Friday in the AT&T Pebble Beach Pro-Am, joined by Lucas Glover, Paul Casey and Scott Langley, when the second round was suspended because the rain had formed large puddles on the greens. It's Spieth who is now the betting favorite at Bovada, listed at +225. Mickelson is +450, Casey is +600 and Langley is +800. They played more golf than expected by moving up the start by an hour, and it was entertaining as ever. One day after Mickelson didn't miss a single fairway for the first time in 1,664 rounds on the PGA Tour, he couldn't seem to find one at Spyglass Hill. He still managed to surge into the lead, including one 3-wood from 256 yards out of the trees on the par-5 14th to 6 feet. It caught up with him at the end. After banging in a birdie on the par-3 fifth, Mickelson missed three straight fairways that led to three straight bogeys until he closed with a 4-iron to 18 feet for birdie and a 4-under 68. "I hate not finishing the round off, making three bogeys after having a pretty good round going in," Mickelson said. "I'm also lucky to get done now and get the round over with and have ... guys unfortunately are still out there playing in some tough stuff." Mickelson was the first to finish at 10-under 133. Glover started strong in tame weather at Pebble Beach and shot a 6-under 66 to get to 10-under 134, while Langley (69 at Spyglass Hill) and Casey (7-under 64 at Monterey Peninsula) narrowly finished at 10-under 133 ahead of the horn that ultimately stopped play for the rest of the day. Three short blasts signaled the stoppage, but because it wasn't a dangerous situation, such as lightning, players could complete the hole. Casey was on his final hole at Monterey when he heard the horn, followed by two more. "I went from upset to happy in an instant," he said. Spieth was among 44 players who had to return Saturday morning — weather permitting — to finish the last two holes of his round. Part of him was happy to be off the course considering the fight he had on his hand in cold, raw rain with increasing wind. Spieth shot 31 on the back nine at Spyglass Hill to get in the mix, and missed two good birdie chances to start the front nine. "I got off to a really nice start, which helped, knowing that the conditions were blowing in, trying to take advantage of the front nine," he said. "And then once they started to come in, it was just try and hold on for dear life." He went just long of the green on the par-3 fifth hole, his ball in the sandy dune above the green about 3 inches from the collar of rough with not much green between him and the hole. Spieth blasted out to 4 feet and saved par. After coming up short on the uphill sixth into the wind, his 40-yard pitch checked and stopped a foot from the cup. And then he had another struggle on the par-5 seventh, hitting out from under a tree, over another one and threw the fairway. His third shot was just right of the green, and Spieth immediately called for a ruling when he saw a fan's hand swat the ball onto the green. The rules official talked to the fan, who said he through his hands up when the ball landed in front of him, and that he did not intentionally hit the ball. That meant Spieth played it from the green, instead of chipping from that spot. By the time they got that sorted out, the rain was coming down harder and workers had to use a squeegee — twice — to clear off the standing water. Spieth two-putted for par. A minute later, the rain kept falling and Johnson had to have the green cleared for his putt. Johnson, who had hit his second shot into the water, missed from 10 feet for bogey. He missed from inside 3 feet for par on the previous hole, and missed another 3-footer on No. 3. He was 2 over for his round, seven shots to par behind. "Not a good day on the greens," Johnson said as he walked away, sounding like someone who had one of those days before. Two of the fairways Mickelson missed on the front nine were on par 5s, one leading to par, the other a bogey. He needed to avoid the water left of the seventh green and pulled it too much into the trees, came up short of the green and hit a poor chip, missing the putt. "I didn't miss a fairway yesterday. Here you've got to be in the fairway, and I was fractionally off on a couple of the holes, both par-5s on the front, and that ended up costing me probably three shots," he said. Jason Day was at 9 under with three holes remaining at Spyglass, while Ernie Els had a 68 at Spyglass and was at 6 under. It was the first time Els had posted consecutive rounds of 60s in the same tournament on the PGA Tour since June 2017. Day is +500, the third-best odds at Bovada.